Congress should reauthorize the D.C. Opportunity Scholarship Program to offer security for families currently served and to expand it to meet unmet demand, Education Secretary Betsy DeVos said Wednesday. “We know this program has been a political football in too many ways and for too many years. The most important thing for a program to be successful in the long run is to have predictability and stability,” DeVos said during remarks at The Heritage Foundation, a conservative think tank. The event, part of National School Choice Week, marked the 15th anniversary of the program. DeVos appeared in a wheelchair after breaking her hip and pelvis in a Dec. 30 bike accident. 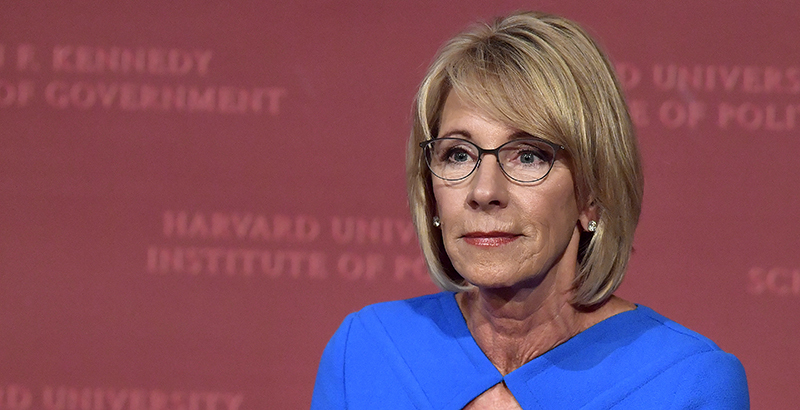 Unmet demand for scholarships is the best barometer for its success, DeVos said during a 15-minute conversation with Heritage Foundation President Kay Coles James. Since the program’s founding, 24,351 students applied, and 10,701 received scholarships, according to Serving Our Children, the nonprofit that administers the program. Other research has found that many students who are accepted into the program do not use the vouchers, a number that has been increasing over time. The program, which provides private school scholarships to about 1,600 children a year, is authorized through the current fiscal year, which ends Sept. 30. The authorizing legislation also provides funding for D.C.’s traditional public schools and charter sector. The three-sector approach has spurred improvements for students across the city, DeVos said. Evidence of the voucher program’s effectiveness is mixed, however. Research has found that students’ standardized test scores tend to go down, particularly in math, but that participating students graduate from high school at higher rates and parents believe the schools to be much safer. Recent research found no effect, positive or negative, on college enrollment. The program has been criticized for lax oversight, and city officials have called it an inappropriate federal intervention into local affairs. DeVos, who worked for private school choice programs as an advocate and philanthropist before becoming education secretary, recalled that the program’s initial support was bipartisan, both on Capitol Hill and from local officials. The program has gone in and out of favor with Congress in its decade and a half of existence, and at one point in the early years of the Obama administration it was closed to new students. Many of its top champions, including former House Speaker John Boehner and Sen. Joe Lieberman, have left Congress. “We need new allies,” Katherine Haley, senior director of K-12 education programs at Philanthropy Roundtable and a former congressional aide who worked on the program, said at a panel discussion after the secretary’s remarks. DeVos, Trump, and participating families should advocate for Congress to extend the program as well as provide additional funding, she said.